Don't ask members of the Coney Island Polar Bear Club how warm it has to be to swim. These winter swimmers plunge into the Atlantic Ocean every Sunday from November until April and revel in the chill. Swimming temperatures are a matter of preference -- some people can tolerate much colder temperatures than others. People even acclimatize themselves to swim in the Arctic for short distances. Generally, water cooler than 60 degrees Fahrenheit poses danger to swimmers who go for longer than two hours. After two hours in 60-degree Fahrenheit water, your risk of unconsciousness and death by drowning increases to 50 percent. When water is cold, your body sends more blood to your core -- away from the muscles in your limbs that you need for swimming. You can tolerate cold-water swimming for more time when wearing a wet suit, neoprene cap, gloves and booties. For example, USA Triathlon permits competitors to wear wet suits in water colder than 78 degrees. 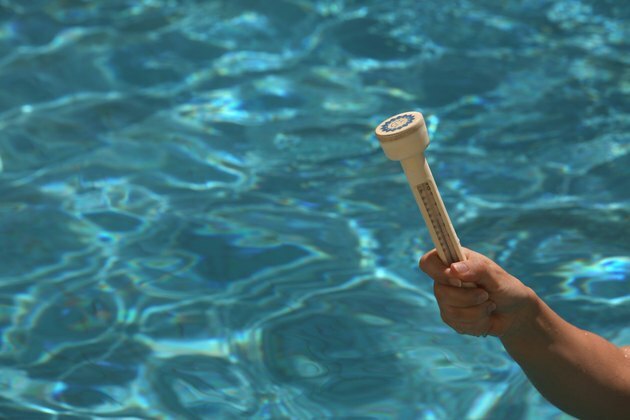 The United States Water Fitness Association suggests specific temperatures for pool water. Younger children and the elderly generally need warmer temperatures ranging from 84 to 94 degrees Fahrenheit, while a comfortable pool temperature for adults is 85 to 89 degrees. If you are swimming for fitness, cooler temperatures of 78 to 84 degrees are recommended. Coney Island Polar Bear Club USA: Cold Enough for Ya?